At the invitation of Vice President Li Yuanchao, Vice President Teodoro Nguema Obiang Mangue of the Republic of Equatorial Guinea will pay an official visit to China from July 10 to 15. At the invitation of Foreign Minister Wang Yi, President of the 72nd Session of the UN General Assembly, Miroslav Lajcak, will pay a visit to China from July 13 to 14. Q: Last night a US B-1B bomber flew over the South China Sea. Do you know exactly where the plane flew and what is your reaction to this? A: We have noted the relevant report. I have not got the details yet. I have to stress that the freedom of navigation and overflight in the South China Sea has never been a problem. The Chinese side has always respected and supported the freedom of navigation and overflight in the South China Sea enjoyed by all countries under international law. However, we firmly oppose the flexing of military muscles by individual countries to endanger China's sovereignty and national security under the pretext of "freedom of navigation and overflight". Q: Yesterday the Chinese and ROK heads of state held a meeting on the sidelines of the G20 Summit. Has the meeting ended with any outcomes? 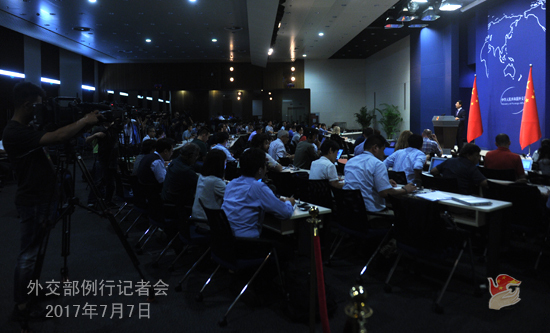 A: We have issued a press release on the meeting between the Chinese and the ROK leaders, and you may refer to it. The two heads of state held a meeting on the sidelines of the G20 Summit and exchanged views on bilateral relations and issues of mutual concern, in particular the situation on the Korean Peninsula. I believe this is in the interests of the two countries, and conducive to the improvement and development of bilateral relations as well as peace and stability of Northeast Asia and the Korean Peninsula. Q: Just now you announced the upcoming visit by President of the UN General Assembly Miroslav Lajcak. What is his itinerary in China and what are China's expectations for his visit? A: During the visit by President of the 72nd Session of the UN General Assembly and Foreign Minister of Slovakia Miroslav Lajcak, the Chinese leaders will meet with him and Foreign Minister Wang Yi will hold talks with him. The two sides will exchange views on the work of the UN General Assembly, such international and regional issues as the implementation of the 2030 Agenda for Sustainable Development, and cooperation between China and the UN. The Chinese side sets great store by the important role played by the UN in addressing global challenges and threats. The Chinese side will actively support the work of the UN General Assembly and deepen its cooperation with the UN in various fields. Q: The Global Times said today that the rise of trade in the first quarter between China and the DPRK was unexpected, and masked a declining long-term trend. Is this the stance of the Chinese government? Do you agree with this conclusion? A: As for the specifics of trade between China and the DPRK, especially the relevant figures, I will refer you to the competent authorities for commerce. 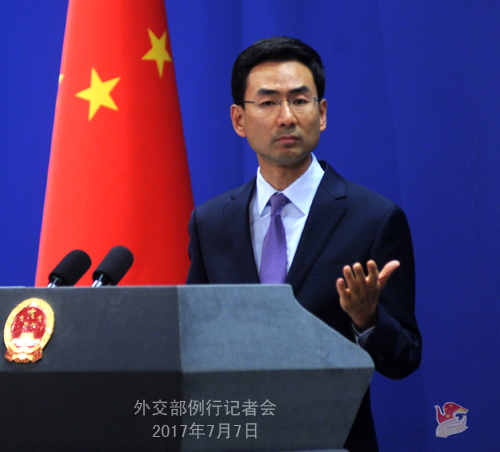 As I said yesterday, as a neighbor of the DPRK, China maintains normal economic exchanges and trade with the DPRK. Meanwhile, as a permanent member of the UN Security Council, China has been implementing DPRK-related resolutions in a comprehensive, strict, accurate and faithful manner and fulfilling its international obligations. Q: Foreign ministers of Egypt, Saudi Arabia, the United Arab Emirates and Bahrain issued a statement in Cairo on July 5 to express their dissatisfaction with Qatar's reply to their conditions. How do you comment on that? How do you think the crisis in the Gulf should be resolved? A: We have noted the latest developments of the situation. 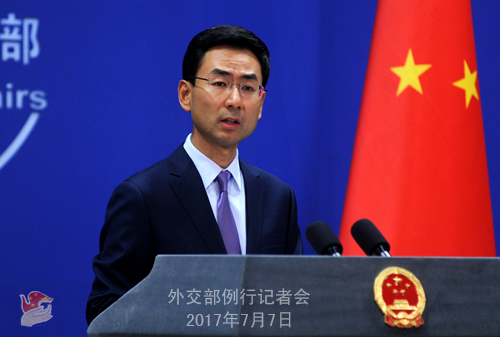 China hopes that relevant countries can properly solve their differences through dialogue and negotiation within the framework of the Arab and Gulf states and that the situation in the Gulf will come back to stability as soon as possible. Q: First, the Malabar naval exercises between India, the US and Japan will start on July 9 in the Bay of Bengal, which will be the biggest of its kind so far. What are your comments on that? Second, there was a common understanding between the Chinese and Indian special representatives on boundary affairs in 2012 that the tri-junction would only be finalized after consultation with Bhutan. This suggests the recognition of disputes over the tri-junction. How do you comment to that? A: On your first question, we have stated on many occasions that we have no objection to the development of normal relations and cooperation between countries. We hope such relations and cooperation are not targeted at a third party and are conducive to regional peace and stability. Regarding your question on the tri-junction, we have given the answer previously and I will reiterate our stance. Just as its name implies, the tri-junction is a point rather than a line or an area. The Convention Between Great Britain and China Relating to Sikkim and Tibet (1890) clearly stipulates that the Sikkim section of the China-India boundary commences at Mount Gipmochi in the east. The illegal trespass by the Indian troops took place at the Sikkim section of the China-India boundary over 2000 meters away from Mount Gipmochi and has nothing to do with the tri-junction. The Indian side, in disregard of the boundary convention, takes the whole Doklam area as part of the tri-junction. This is obviously an attempt out of ulterior motives. The Indian side tries to introduce the concept of tri-junction into this incident and equate that point with an area. They are misleading the public. Q: It is reported that US authorities have tried to seize millions of dollars of funds from companies that deal with the DPRK through international banks, one of which is a Chinese company in Dandong. Are you aware of this case? Has China talked about this with the US? A: First, on the Korean Peninsula nuclear issue, China and the US maintain communication and coordination. The channel between the two sides is unimpeded and we know each other's stances. 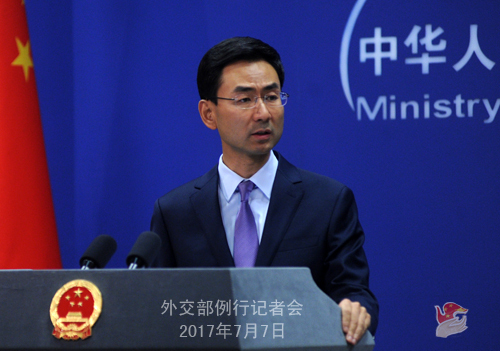 Second, as to trade and economic cooperation between China and the DPRK, we have said many times that China has been implementing DPRK-related resolutions in a comprehensive, strict, accurate and faithful manner and fulfilling its international obligations. China's efforts are there for all to see. If anyone or any organization violates the resolutions in China, we will handle it in accordance with laws and regulations. This is out of question. Third, as we have repeatedly said, we oppose any country's so-called "long-arm jurisdiction" over other countries based on its domestic law. Q: President Xi Jinping and President Trump plan to meet on the sidelines of the G20 Summit in Hamburg. Has it been finalized? What are the main topics? In his phone call with President Trump on July 3, President Xi said the China-US relations were affected by some negative factors. What is China's expectation for this meeting? A: Not long ago, President Xi Jinping had a telephone conversation with President Trump, during which the two presidents agreed to meet each other in Hamburg. The two sides are still coordinating the meeting schedule. I believe by then the two state leaders will exchange views on China-US relations and other international and regional issues of mutual concern. We believe it is very necessary and of great significance for the two state leaders to maintain communication through various means, which will help the two sides enhance mutual trust and exchange views on relevant issues in a timely manner. We hope they can reach further consensus in their meeting at Hamburg on deepening cooperation and managing differences, and move forward the sound and steady development of China-US relations. Q: You have been referring on and off about the Convention Between Great Britain and China Relating to Sikkim and Tibet (1890), does that cover the Doklam area or the tri-junction? A: The tri-junction is a point rather than a line or an area. The Indian side who attempts to equate a point with an area is of ulterior motives. The Convention Between Great Britain and China Relating to Sikkim and Tibet (1890) explicitly stipulates that the boundary between Sikkim and Tibet commences at Mount Gipmochi in the East and follows the water-parting to the point where it meets Nepal's territory in the West. This, I believe, is clear. Q: The status quo and the situation at the China-India boundary have changed after the 1962 war, so it does not make any sense talking about an agreement that was made when India was under British rule. Has the Indian side ever recognized after 1962 that the Sikkim section was delimited? A: The Indian government has stated unequivocally their recognition of the validity of the 1890 Convention many times. The boundary between Sikkim and Tibet was delimited by that convention. Once signed, the convention's legality and validity shall not be affected by the change of regime or state system, and still less the certain point of time you mentioned. Follow-up: My question is has there been any agreement between the two sides in this area after 1962? A: As I said, there is no point mentioning 1962. Once signed, the boundary convention's legality and validity shall not be affected by the change of regime and the passing of time.